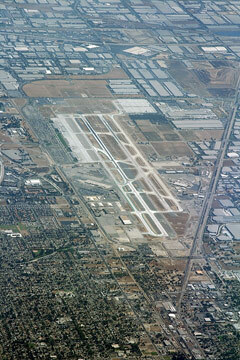 The primary airport in the Los Angeles, California area is the Los Angeles International Airport. Los Angeles International processes about 30 million boardings per year. 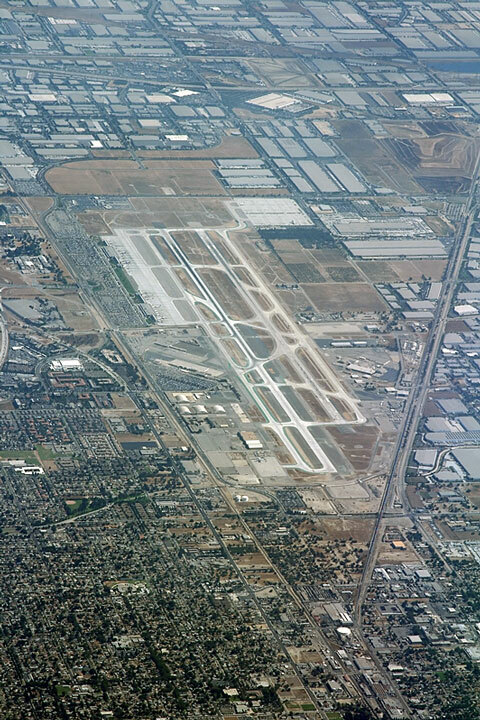 Other major Los Angeles area airports include the Burbank Bob Hope Airport, the John Wayne Airport in Orange County, the Long Beach Airport, the Mc Clellan-Palomar Airport in Carlsbad, the Ontario International Airport, the Oxnard Airport, and the Palm Springs International Airport. This section features an airport locator map that can be zoomed and panned to show the Los Angeles, California area or a larger region of the state. Use the plus (+) and minus (-) buttons to zoom the map in and out, respectively. Simply swipe or drag the map to pan it in any direction. At high zoom levels, the airport markers on this California map can help travelers find airports in the state and plan their air travel arrangements more efficiently. Click or touch one of the following options to display a Los Angeles airports map in framed or full-screen mode. This Los Angeles, California airport map shows commercial service airports, reliever airports, and general aviation airports in the Los Angeles area. Primary airports are designated with an airplane symbol.